Tweeters for usage in home HIFI boxes have traditionally been part of the LPG production program. In this production line classical magnetic drives are employed. Mounting plates of synthetic, aluminum or diecast materials can be combined with variable moving parts of aluminum, fabric or magnesium. LPG was one of the first OEM manufacturers that used neodymium drives. This technology allows especially in the automotive field a very small and light construction of the tweeters. Also here it is possible to use very flexible fabric-, aluminum-, titan- and supronyl-domes. Cone loudspeakers are almost infinitely variable. The baskets are constructed of synthetic material, aluminum diecast or the classic powder coated sheet metal. 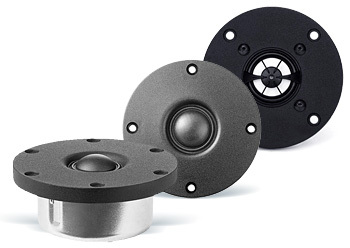 The drive systems consist of the well known ferrit magnets, but also of neodymium material that is noted for its high energy and light construction qualities. 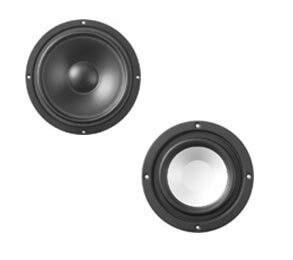 Cone- respectively coaxial loudspeakers are produced in sizes from 75 mm up to 310 mm. Diaphragm materials beginning with the classic high value paper, followed by coated paper, up to polypropylene, aluminum, fiberglass, Kevlar, Rohacell-sandwich and Hexacone-sandwich are used according to customer specific requirements. For one of the largest spinning machines LPG manufactures sensors and tensioners that are designed to ensure a constant thread tension. LPG’s experience in production has contributed to the success of this product.